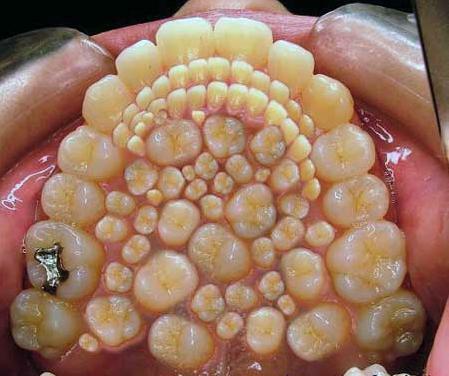 An interesting patient with hyperdontia. Three supernumerary premolars in the lower jaw. Luckily the arch is straight and the treatment plan is easy – just removing the extra premolars. This entry was posted in Supernumerary Teeth, Treatment of Supernumerary Teeth on April 28, 2014 by admin. The increasing number of people looking for the dentist services has led to the development of dentist charts that are used in the numbering of human teeth. There are different systems that dentists use in numbering of the teeth with the supernumerary teeth numbering system being one of the most common ways that can be found in most dentist charts. The supernumerary system of numbering teeth allows dentists to add the number 50 to the value of the number on which the tooth is located. The numbering starts on the upper right jaw with the first teeth being the Molar tooth on this side of the upper jaw. Since it is the first tooth, the supernumerary value of this tooth becomes 51. The next tooth has the value 52 with the last of the eight teeth of the upper right jaw getting the value 58. The upper left jaw continues with numbering with the first tooth getting the value 59 and the last tooth on the extreme side of the upper left jaw, the molar getting the value 66. The lower jaw values for the supernumerary numbering run from 67 to 74 in the lower left jaw and 75 to 82 on the lower right jaw. This system remains as one of the best for dental teeth numbering in the dentist charts. It would be important to point out that the supernumerary teeth numbering system varies from one country to another. The system that is used in the United States varies greatly with one used in some European countries like Germany. The United States system allows for the numbering of the teeth by adding up 50 to the number of the teeth where one starts from the extreme molar tooth that is in the upper right jaw with the last teeth given the value of 16 being the Molar tooth in the extreme part of the upper left jaw. When these teeth are numbered supernumerary the values become 51 for the first tooth on the upper right jaw and 66 for the last molar teeth in the upper left jaw. This totally different from the system of numbering in most European countries where most dentists prefer to use alphabetical order values in the numbering of teeth in their charts. The need to have a uniform system of numbering teeth in the world has led to the suggestion of adopting the US supernumerary system by some dentists. Whether these suggestions will be adopted by the dentists is something that we eagerly await upon, only time will tell. This entry was posted in Supernumerary Teeth, Supernumerary Teeth Facts on February 8, 2014 by admin. The supernumerary wisdom teeth can cause orthodontic problems during its eruption. This is a rare dental condition but it is associated with pain and tooth crowding. Having supernumeraries in this area of the mouth also effects the hygiene because the tooth crowded areas are hard to brush with a regular toothbrush. This entry was posted in Supernumerary Teeth, Supernumerary Teeth Facts on December 13, 2012 by admin. Having white spots on the gums should alarm the dentist for possible immunodeficiency states. This entry was posted in Supernumerary Teeth, Supernumerary Teeth Facts, Treatment of Supernumerary Teeth on November 6, 2012 by admin. Sometimes the patients complain of white spots on their front teeth. Such condition may be hereditary but most of the times are due to some other factors that we will discuss in this article. The white spots on the teeth are mainly a cosmetic issue but should be taken under serious consideration because it may be an early sign of initial tooth decay. 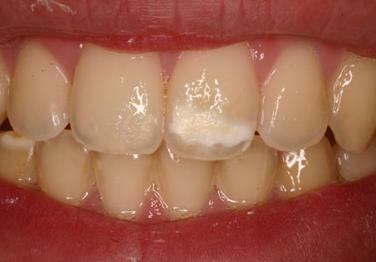 The white spots are usually a result of enamel demineralization. This is how the caries begins – the acids from the bacteria that reside in the mouth and the acids from the food cause this loss of minerals. If the ph stays lower than 5.5 there is no balance between the demineralization and remineralization and loss of minerals is at place. 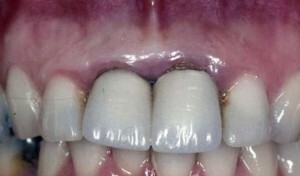 This process can be seen on the tooth as opaque areas. These opaque areas have a white color and people complain of “white spots on their teeth”. Having such hypocalcified spots does not mean that the patient’s hygiene is bad, sometimes can be caused by other factors like wearing braces for a long time. In these cases the hygiene is hard to be improved due to this plaque retention factor. The mineral loss can be caused by consuming too much acidic foods (citric fruits, drinking juices with low ph). People do not realize how acidic some foods may be. Let’s take for example Coca Cola. While drinking it you feel the sweet taste but that does not mean that it does not contain acidic components. As a matter of fact such juices and drinks are the most dangerous for the enamel, you feel they are sweet but they contain a huge amount of acids and sugar at the same time. Keep in mind that the cariogenic bacteria in the mouth use simple sugars for living and their final metabolic product are acids. In this way acids are delivered by the juice itself and from the bacterial terminal products of metabolism. These demineralized areas can be restored if the ph is raised over 6.5 ph. The white spots can also be a result of hereditary conditions such as enamel and dentine hypoplasia. The mineralization of the tooth tissue is lower than usual but that is not a consequence of acidic foods or poor hygiene but other factors we will discuss later on. Sometimes babies have teeth that are present in their mouth at the time of their birth. 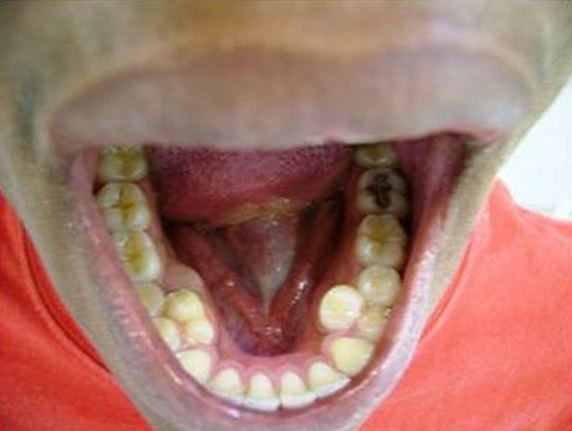 They are called natal teeth and their presence is very uncommon. According to National Institute of Health studies they appear in one of 2000-3000 babies. Usually this is the set of the lower central incisors. 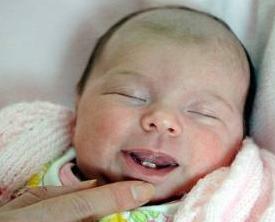 The babies born with teeth have to be monitored because this condition could cause some problems. What to do with the natal teeth? The doctors should decide what to do with the natal teeth. They can be extracted before the mother has started nursing. The natal tooth can hurt the mother’s breasts and also cause choking if the tooth is loose and at some point it falls in the baby’s throat. Don’t worry if your child has lost his natal tooth because he will still have his decidous and adult teeth and won’t affect their development and eruption. If the babies are born with a loose tooth it is better to be extracted. Another decision the dentist can take is to keep the natal tooth. If it doesn’t have pointy and sharp edges and doesn’t bother the breastfeeding the tooth can be kept. Keep in mind that it is a retention factor and should be cleaned often. That can happen by rinsing or rubbing the gums with cloth soaked in hydrogen hydroxide. If the tooth is sharp it can be polished with a bur and other polishing brushes and disks. The baby can hurt the mother’s breast and even himself when sucking his own teeth. 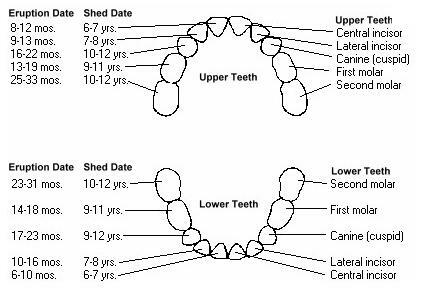 It is very important for the clinician to be aware of the teeth eruption dates. Not only for the primary but also for the permanent teeth. In this way the diagnosis of the supernumerary tooth will be easier to place. The eruption dates can vary and depend on hereditary factors but there are certain periods in which the tooth eruption is considered as premature or delayed eruption. 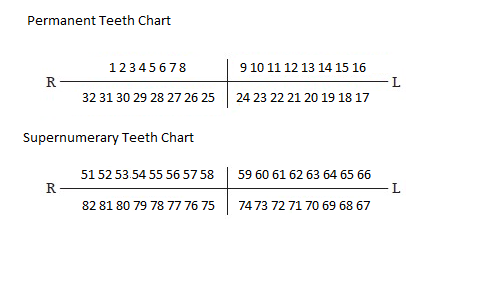 The baby teeth chart will help you orientate about the normal eruption dates. The presence of these conditions should alert the dentist to a potential problem. Sometimes the patients complain about a weird change in the color of their gums. They come to us complaining about their bad outlook and want to solve this problem as soon as possible. This situation may happen very often in the regular dental practice since most of the patients are concerned only about the esthetic point of view. On the other hand the clinicians have a different way of evaluating these conditions and are mostly concerned about the function and anatomical health of the surrounding tissues. As a matter of fact both points of view meet in the right clinical decision when it comes to gum diseases. The best way to evaluate the importance of the clinical case is by obtaining the medical history information- what the complaints are, the history of the complaint, past dental issues, social and family dental and medical history. The patients have noticed a significant change in the gingiva margin which is close to the tooth crown. They say “Doctor, my gums turned black and look awful. Is there an explanation for this color change and what can I do to restore their previous color?” When we observe a healthy gingiva its normal color is pink. Actually this pink color comes from the small arteries and capillaries in the gums.